"We had 500 at our first showing and 30 decisions for Christ!" Based on one of the top Christian films of the year, God's Not Dead, Outreach and Pure Flix Entertainment are proud to announce a series of film-based resources for churches! Invite your church and community to discover what they believe and to stand for it with a God's Not Dead Movie License, Sermon Series and Small Group Study! 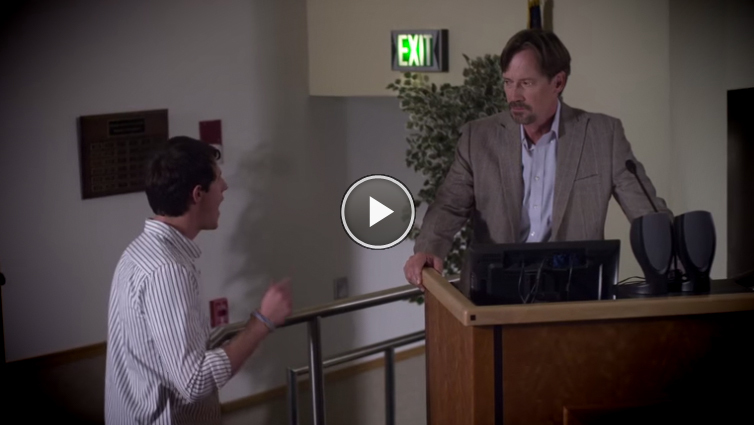 Present-day college freshman and devout Christian, Josh Wheaton (Shane Harper), finds his faith challenged on his first day of Philosophy class by the dogmatic and argumentative Professor Radisson (Kevin Sorbo). Radisson begins class by informing students that they will need to disavow, in writing, the existence of God on that first day, or face a failing grade. As other students in the class begin scribbling the words “God Is Dead” on pieces of paper as instructed, Josh find himself at a crossroads, having to choose between his faith and his future. GOD’S NOT DEAD weaves together multiple stories of faith, doubt and disbelief, culminating in a dramatic call to action. The film will educate, entertain, and inspire moviegoers to explore what they really believe about God, igniting important conversations and life-changing decisions. God's Not Dead weaves together multiple stories of faith, doubt and disbelief and will educate, entertain, and inspire people to explore what they really believe about God, igniting important conversations and life-changing decisions. Digital Resources including: Templates for bulletin inserts and tickets and discussion questions. God's Not Dead Church License Movie Package- Includes FREE Church Kit and Small Group Studies, exclusively from Outreach! This blockbuster film with a star-studded cast is perfect for seekers who have questions about God's existence and believers who want to learn how to defend their faith. God's Not Dead weaves together multiple stories of faith, doubt and disbelief and will educate, entertain, and inspire people to explore what they really believe about God, igniting important conversations and life-changing decisions. Filled with Scripture readings, group discussion points and questions, the six-week study guide will help small group members discover what they believe and how to stand for it. For use with the God's Not Dead DVD-based Study Kit for Adults. Filled with Scripture readings, group discussion points and questions, the four-week Student Guide will help small group members discover what they believe and how to stand for it. For use with the God's Not Dead DVD-based Student Kit.